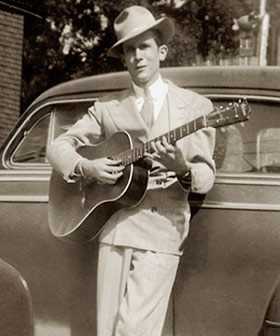 Born in Mount Olive West, Ala., on Sept. 17, 1923, Hiriam "Hank" Williams was the third child of Lon and Lillie Williams. Lon, a World War I veteran, was hospitalized during most of Hank's early life, leaving the boy's upbringing to his strong-willed mother. Small and fragile from the beginning (and afflicted with spina bifida), Hank may well have gravitated toward music as an alternative to sports. While living in Georgiana, Ala., he befriended Rufe Payne, a black street musician known as "Tee-Tot." Years later, Hank would say that Payne had given him "all the music training I ever had," and most biographers consider Payne the source of the noticeable blues thread running through Hank's music. At 16, living in Montgomery, Williams quit school and began his music career in earnest. He made his first radio appearance on WSFA in late 1936 or early 1937 and soon became one of the station's most popular performers. He also worked beer joints and regional shows with his band, already named the Drifting Cowboys. Lillie drove the group to venues in her station wagon and collected gate money. By the early '40s, Hank was one of the biggest draws in the region and had come to the attention of several Nashville artists and music business luminaries. But his reputation as a singer was already matched by the one he'd built for drinking and unreliability. Most considered him an unsafe bet. In 1943 Hank met Audrey Mae Sheppard, an Alabama country girl with a two-year-old daughter, Lycrecia, from a failing marriage. Audrey learned to play stand-up bass, well enough anyway, to play in the band, and began acting as manager. Audrey and Hank were married in December 1944. She desperately craved a singing career, pushing for inclusion in the show at every chance. Her ambition, however, far exceeded her talent. Audrey would vie with Lillie for Hank's attention throughout the relationship. In 1946 she accompanied her husband to Nashville to meet publisher Fred Rose. Rose, in a partnership with Roy Acuff, ran a successful "hillbilly" publishing concern (Acuff-Rose, later a giant in the industry) and at first was interested in Williams only as a writer. (Hank had begun writing songs shortly after he started singing and playing guitar and sold songbooks at his club appearances.) 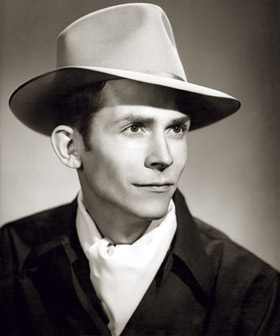 Within the year, however, Rose had made Hank's singing career a pet project and arranged for him to record four songs for the Sterling label in December 1946. In March 1947, in a deal engineered by Rose, Hank signed with MGM. "Move It On Over" was his first MGM release and his first Billboard chart entry. 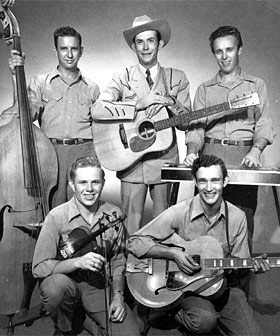 He charted again in April 1948, with "Honky Tonkin." Back home in Montgomery, Hank seemed poised for stardom; his regional popularity was higher than ever, bolstered now by his recording success. But he had entered the low arc of a cycle that would haunt him for the rest of his days. More often than not, he showed up drunk (if at all) for live appearances and was increasingly difficult for even his best friends to be around. Many, including Rose, gave up in frustration. Audrey filed for divorce in late April. 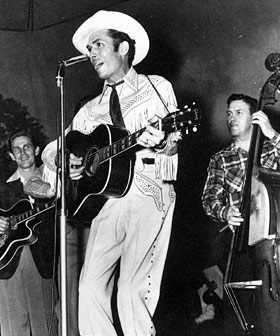 With the big-time nearly in his grasp, Hank Williams was bottoming out. Hank's story could easily could have ended there, but the Williams reconciled, the relationship with Rose was mended, and Rose set about finding an avenue for greater exposure for Williams. Decision makers at the Opry were still wary, but KWKH in Shreveport, La., was interested in the emerging star for their Saturday night jamboree, the Louisiana Hayride, and Hank joined the show in August. "I'm a Long Gone Daddy" had recently reached No. 6, but his next four releases failed to chart, and a fifth, "Mansion on the Hill," stopped short of the Top 10. KWKH's 50,000 watts were beamed into living rooms all across the Southwestern U.S. every Saturday night, but his records were falling flat. Had he peaked? Was he, after all, only middling star material? Nearly 50 years later, in a world where today's icon is tomorrow's inconsequential, it is difficult to imagine a song so igniting radio listeners that it holds the top spot on the charts for sixteen weeks. No one in Hank's circle wanted him to waste time or tape on "Lovesick Blues." The song was a throwaway, they said; a piece of fluff that was more likely to damage his career than enhance it. Hank was insistent, though, and the song was given two quick passes at the end of a session. Released in February 1949, it was No. 1, and more, by early May. "Lovesick Blues" was an "event;" popular beyond precedent, imagination or belief. And suddenly, Hank Williams was big. Big enough at last for the Opry. With success came increased creative freedom. Hank's "mainstream" songwriting and recording efforts continued to do extremely well, but he also delved into remorseful gospel themes and a series of recitations under the transparent pseudonym "Luke the Drifter." Hank the writer often seemed preoccupied with mortality and the futility of human relationships, his marriage to Audrey was now in steady decline, and those who knew him could easily see the real-life parallels in songs like "You're Gonna Change (Or I'm Gonna Leave)" and "Cold, Cold Heart." Clearly, here was a man displaying his demons for all to see. Hank didn't have to "interpret" sad songs; he had only to sing from his heart. For a time, fame and fortune staved off the consequences of his self-destructive lifestyle. By mid-1952, however, his life was coming apart at the seams. Wracked with back pain, he was dependent on alcohol and, it is believed, morphine. Often missing or too drunk to perform at curtain time, he was fired by the Opry. Audrey again filed for divorce, and Hank headed back to Shreveport and the Hayride. In his final weeks, Hank spun hopelessly out of control. Even his marriage to pretty young Bilie Jean Jones couldn't slow his headlong plunge. Sometime after midnight on New Year's Day 1953, sleeping in the backseat of his Cadillac en route to a show, Hank Williams fulfilled the prophecy of his own "I'll Never Get Out of This World Alive." 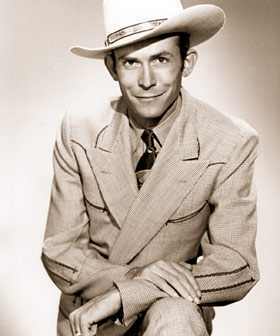 Three of Hank's recordings reached the top of the charts in the year following his death. By 1954, his earthly voice silenced, the fragile young man from Alabama was only a legend. But in his last few torrid years, he had changed country music forever and his musical legacy remains its cornerstone.